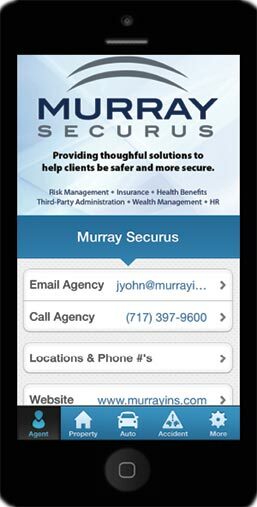 Take Your Insurance Information on the Go! Accidents can happen at any time, and when they do, you need to be prepared. Quick access to home content records, auto information and policy details will help ensure the quickest and best outcome for your claim. Bill Pay/Claim Reporting – Quick link access to your insurance company website to pay your bill or report a claim online. Store Home/Auto Policy Detail – Enter your property and auto policy details for easy access. No need to type! Just use your smartphone’s voice controls and “speak” them right into your device. Simple! Home Inventory – Do a complete home inventory with photos and video, then share it with your agent or estate/tax planner. It’s easy and it’s a great resource should you have a homeowners claim. Mobile Accident Report Kit – Goodbye paper! Take photos at the accident scene, collect witness information, call a tow truck and more. Then send the report to yourself and/or report the claim to Murray Securus.